As writers, we spend months and even years getting that perfect story down on paper. But, as many established authors know, that’s only the beginning of getting a book published. A critical phase that ensures your work shines involves the role of an editor. Today, The Writing Well delves into the often hidden world of book editing. Jamie Chavez, a developmental editor and writer who has worked nearly 20 years in the publishing industry, shares her process of enhancing manuscripts from the moment that they first land on her desk. Q. I saw on your bio that you were a writer long before you became an editor. When did you know you wanted to be an editor? I didn’t consciously have a thought like I want to grow up to be an editor. But I’ve always been bookish. I read a lot. I’ve always read a lot of literary criticism and admired the famous editors. (Always reading the acknowledgments!) When I landed a job at a publishing house I had a wonderful editorial mentor who encouraged me. I started reading books proposals, though, and that’s when I knew for sure. Q. I’ve often heard that the real creation of a novel isn’t in the writing phase but in the editing phase. How does editing contribute to a finished work? An editor is essential, without doubt. And it’s dismaying to correspond with new writers who think (first) what an editor does is fix grammar and punctuation, and (second) that’s all they need. These writers don’t even have a concept of substantive editing (it’s also called developmental editing, macro editing, content editing …) and yet no traditionally published book goes to press without it. Q. What is your “process”? The basic plot (ha) is the same, in that I read the manuscript once to react emotionally to it (making some notes in the margin); a second time to take notes (timeline, characters, story arc outline, and on and on) and also make more margin notes; then I write up my editorial notes. During that process I’ll end up reading most of the manuscript again. I like to use examples from the MS to make my points. Then I send the MS and my editorial notes back to the author, who reads and absorbs and questions and tweaks, and sends it back to me. We might go back and forth two or three or ten more times, depending on the publisher’s precise assignment (sometimes a copyedit is requested as part of the package, for example). The process is different, of course, in that every manuscript presents its own unique set of things to work on. Q. What is the most challenging aspect of editing for you personally? Writing the editorial letter. Every manuscript is different; it’s not like I can use a template. So I have all these notes, and I have to organize them in a way that will be coherent. More importantly, though, is the way I communicate my critique to the author. I mean, let’s face it: an editorial letter is criticism. I was/am the bossy older sister, so this role (ahem) comes naturally to me. But communicating in writing can be touchy. I want to be businesslike—after all, my job is to work with the author to improve the manuscript, and we both know that—but I also want the author to feel I’m on his or her side. Because I am. It often takes me a week just to write the ed notes. Q. What are the most common mistakes first-time or even veteran writers make when writing their novel? Q. When should an author work with an editor? After the first draft? Before seeking an agent or publisher? After he or she is under contract? Let’s clear one thing up right away: never after the first draft. Seriously, I don’t ever want to see your first draft. Editing’s not an inexpensive process, and an author would want to send his or her very best work to an editor to get the most bang for the buck. There are two schools of thought regarding working with a professional editor before seeking an agent or publisher. (I’m working on this blog post too! Stay tuned.) One says it’s expected an author will do what she can to improve her skills and present the most polished manuscript possible … and publishers prefer getting a MS that’s in great shape. The other says a manuscript that’s been heavily edited by a professional isn’t, perhaps, a true representation of an author’s skills. That said, I’ve had several clients go on to get agency representation after we worked on their manuscripts, so clearly it wasn’t a detriment in those cases. If you don’t want to say you’ve been edited, you could choose to have a critique instead; it’s less thorough but should tell you where your MS needs work. After you’ve already gotten a contract, the editorial work will be paid for by the publisher. If there’s an editor you’d like to work with, though, tell your agent, tell the publisher. Q. What questions should authors ask before selecting an editor? First, you should ask yourself if the manuscript is ready for an editor (see comments above about first drafts). If you’re getting “good rejections” (“it’s good but not quite ready”), I would say you’re ready for an editor. Once the decision’s been made to hire a professional, I think it’s fair to ask what books that editor’s worked on (I post all of this on my website), and how long he or she’s been doing this type of work. You should clarify just exactly what is included in the edit. And ask for recommendations. (I have testimonials on my website but can put prospective clients in touch with past clients too.) You should probably ask how long before the editor can begin work on your project; my lead time is three to six months. It is not fair to ask for anything else—like a work sample—without offering to pay for it. Also, you should expect the editor will ask for word count and a sample of the manuscript (a couple chapters and a short synopsis, say); I use this to quote a price and to decide if the project is something I want to take on. Q. Can writers themselves become better editors? What tips can you offer for writers to improve their self-editing skills? First, I’d say if you’ve hired a professional editor at any point in the past, you should go over the copyediting-type changes with a fine-toothed comb, because there’s a lot to be learned there. I’ll tell an author, “Did you see how many THATs I took out?” 🙂 I try to explain in margin notes why I think something should change, so there’s a lot of coaching to be had there too. Finally, there are books you might read. 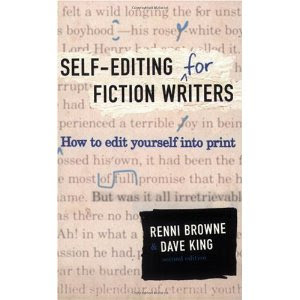 Self-Editingfor Fiction Writers by Renni Brown and Dave King is a good one, but I know there are many others. Q. Is it a good practice to have your novel “peer edited” by other writers? What is your opinion of critique groups? I think a critique group can be invaluable, and not just for editorial advice: it can be a support group too. Most of “my” authors are in critique groups of one sort or another. It’s important that everyone pull his or her own weight, though; some authors I know just have a critique partner. It should be noted that a critique group is not a substitution, really, for an edit. Q. Any final insights for my readers? www.jamiechavez.com. Read her thoughts about words and language, books and authors, writing and editing, and the publishing industry at www.readplayedit.com. This entry was posted in Writing Resources and tagged Book editing advice, book self-editing tips, Jamie Chavez on June 20, 2012 by AnneWainscott.